Now ConceptDraw MINDMAP users and XMind users can freely exchange their mind maps using the Mind Map Exchange solution available in Solution Park. ConceptDraw MINDMAP is great for breaking through barriers in your workflow. Its intuitive thought organization abilities jumpstart stagnant processes and provide a platform for bursts of creativity that launch stalled projects to new heights. In the continued spirit of breaking down barriers, CS Odessa brings you Mind Map Exchange Phase. 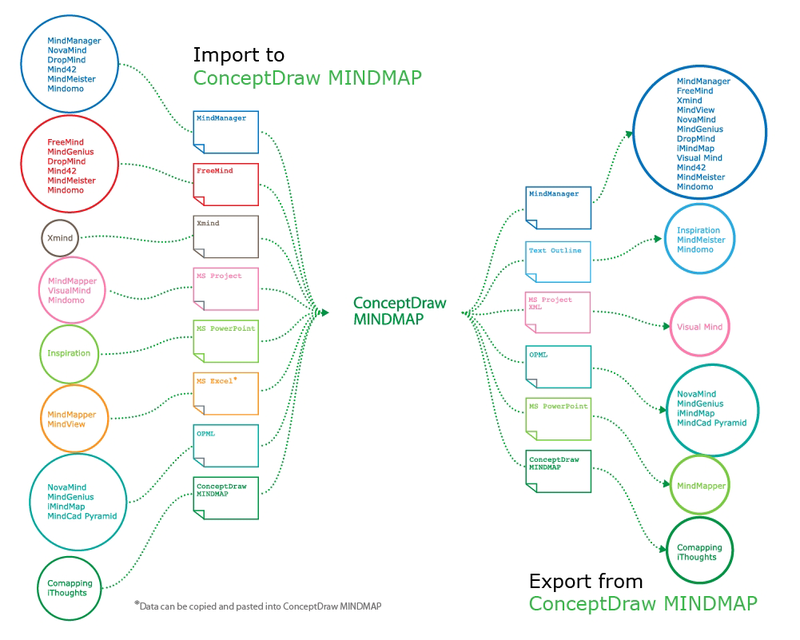 Future phases of Mind Map Exchange will continue to expand ConceptDraw MINDMAP ’s capabilities. Let us know what your requirements are! Our customers’ feedback is vital to our success. MindMap presentation via Skype - Control over the slide-show process which plays on each computer of Skype conference call participants synchronously. Picture: What is MindMap presentation via Skype? How to make great presentation via Skype - It let presenter to control over the slide-show process which plays on each computer of Skype conference call participants synchronously. Another great feature, at the end of presentation each participant of conference call have the copy of presentation document file. It saves in Presentation History folder. Later, its very easy to return back to presentation history and view it again or show for other team. ConceptDraw MINDMAP v10 is great for breaking through barriers in your workflow. Its intuitive thought organization abilities jumpstart stagnant processes and provide a platform for bursts of creativity that launch stalled projects to new heights. In the continued spirit of breaking down barriers, CS Odessa brings you Mind Map Exchange Phase.